With a critical fundraising deadline approaching on Wednesday evening, a host of congressional candidates in tight races are trying to draw Sarah Palin into the race. And not just Republicans. At least four different House Democrats, who have been specifically targeted by Palin for their health care reform votes, sent out fundraising appeals on Wednesday using the former Alaska governor to solicit donations. Now Sarah Palin has literally put my Congressional district in the bullseye, attempting to kill our momentum and take back Florida’s 24th Congressional District. She has specifically identified me as one of the top four targets for defeat this November. I don’t care who comes after me – Sarah Palin can put a target on our district – it’s not going to stop me from standing up for what we know is right; bringing jobs and resources to PA-10. With the first fundraising deadline of 2010 fast approaching at 11:59pm tonight, Wednesday, March 31st, Kathy needs your help. After voting YES on Healthcare and standing up for us, she is now being targeted by Sarah Palin and special interests from outside of Pennsylvania. Well, last week’s passage of the historic health care reform bill provided her some clarity. Immediately after President Obama signed the bill, Palin asked her radical supporters to “target” 20 Democrats, complete with crosshairs taking aim at each of them. Two of them our Clark community helped elect: Rep. Betsy Markey (CO-04) and Rep. Chris Carney (PA-10). When called upon, they stood up courageously and voted for reform. Now Sarah Palin and the right wing have targeted them for defeat. Each of these four candidates was placed on Palin’s list of 20 House Democrats to be targeted for their votes on health care reform — which it seems they view as a blessing of sorts. Caught in tight races, the lawmakers are using the conservative lightning rod to nationalize the election and draw in more money and attention. 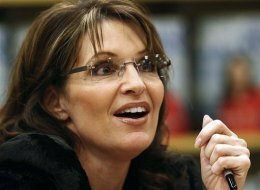 And with little apparent downside — as the prominent Democratic pollster Stan Greenberg pointed out Wednesday morning, Palin, for many, has come to symbolize the edge of acceptable conservative politics (the line of demarcation between Tea Party extremism and mainstream Republicanism). Greenberg’s colleague, James Carville was a bit blunter. This entry was posted in Sarah Palin - Private Citizen and tagged Alaska Governor, Democrats Fundraising Palin, Democrats Palin, Palin Donations, Palin Fundraising, Palin House Democrats, Palin Targets Dems, Politics News, Sarah Palin. Bookmark the permalink.